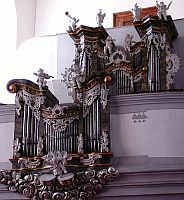 Description: The instrument of Georg Tauchmann (1626-1674) is located in the chapel of the castle Hruby Rohozec. Hruby Rohozec is a small village in the Turnov region, about 100 km north-east of Prague. As the chapel itself was built in 1675, it is probable that the instrument was acquired together with the other furniture at this time. However, Georg Tauchmann died one year before the work was finished and so, it is not exactly clear who has completed the organ after his death. At that time the instrument had a single manual, probably without a pedal. During the 18th century, a positiv organ was added and perhaps the pedal stop could be added at this time as well. The organ case was also newly decorated so that it reflected the style of that age. The private chapel was not widely used for public services during the 19th and 20th centuries, so there was no pressure for a "modernization" of the instrument. Therefore, we are lucky today to find the instrument in its original state. Two manuals have unexpectedly wide compass, more than 4 octaves, up to the high F. The bottom octave is fully built, there is no "short" octave usual in the 17th century. This feature may be explained by the purpose of the organ. It was not ment principally to accompany the liturgical assembly but it had to play dominant role during the courtly services or perhaps even during various concerts given by the castle owners.